Modify the Windows operating system while it's not running. Starting with Windows 10, version 1809, WinPE is an add-on to the Windows Assessment and Deployment Kit (ADK). Previously it was included in the ADK. To get Windows PE, install the ADK, and then install the WinPE addon. For more info, see WinPE: Create USB Bootable drive, WinPE: Create a Boot CD, DVD, ISO, or VHD, or see the Demo: Installing Windows PE on a USB Drive. Batch files and scripts, including support for Windows Script Host (WSH), and ActiveX Data Objects (ADO), and optional support for PowerShell. Applications, including Win32 application programming interfaces (APIs) and optional support for HTML Applications (HTA). Drivers, including a generic set of drivers that can run networking, graphics, and mass storage devices. Image capturing and servicing, including Deployment Image Servicing and Management (DISM). Networking, including connecting to file servers using TCP/IP and NetBIOS over TCP/IP via LAN. Storage, including NTFS, DiskPart, and BCDBoot. Security tools, including optional support for BitLocker and the Trusted Platform Module (TPM), Secure Boot, and other tools. Hyper-V, including VHD files, mouse integration, mass storage and network drivers that allow Windows PE to run in a hypervisor. No hard drive is required. You can run Windows PE entirely from memory. In order to boot Windows PE directly from memory (also known as RAM disk boot), a contiguous portion of physical memory (RAM) which can hold the entire Windows PE (WIM) image must be available. To optimize memory use, manufacturers should ensure that their firmware reserves memory locations either at the beginning or at the end of the physical memory address space. 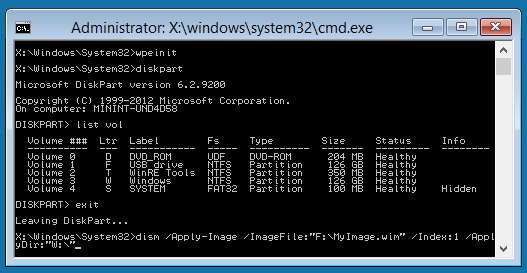 The 64-bit version of Windows PE can boot 64-bit UEFI and BIOS PCs. Windows PE is not a general-purpose operating system. It may not be used for any purpose other than deployment and recovery. It should not be used as a thin client or an embedded operating system. There are other Microsoft products, such as Windows Embedded CE, which may be used for these purposes. When Windows PE reboots, all changes are lost, including changes to drivers, drive letters, and the Windows PE registry. To make lasting changes, see WinPE: Mount and Customize. The default Windows PE installation uses the FAT32 file format, which poses its own limitations, including a maximum 4GB file size and maximum 32GB drive size. To learn more, see WinPE: Use a single USB key for WinPE and a WIM file (.wim). File server or Terminal Server use. Joining to a network domain. Connecting to an IPv4 network from Windows PE on an IPv6 network. Booting from a path that contains non-English characters. Adding bundled app packages through DISM (.appxbundle packages). In general, use the latest version of WinPE to deploy Windows. If you are using customized WinPE for Windows 10 images, you may prefer to continue using your existing Windows PE image and run the latest version of DISM from a network location. To learn more, see Copy DISM to Another Computer. You can use the 32-bit versions of Windows PE and Windows Setup to install 64-bit versions of Windows. For more information, see Windows Setup Supported Platforms and Cross-Platform Deployments. Although Windows PE supports dynamic disks, Windows Setup does not. If you install Windows to a dynamic disk created in Windows PE, the dynamic disks won't be available in Windows. For UEFI-based PCs that support both UEFI and legacy BIOS modes, Windows PE needs to be booted in the correct mode in order to correctly install Windows. For more info, see WinPE: Boot in UEFI or legacy BIOS mode.